all its technological advancements and iterative improvements to our marketing processes -- has theoretically made marketers’ lives easier. We have more options, tools, and resources to be better, faster, and stronger. But the flip side of the coin -- and probably the more realistic manifestation of all these advancements -- is that marketers are overwhelmed. It seems like every week there’s something new we absolutely must be doing, lest we get left behind. Problem is, a lot of this new “stuff,” has quickly become an inefficient use of a marketer’s time and budget. Or worse, it was never a good use of time and budget to begin with. Oops. We’d like 2013 to be the year you clean up your marketing toolkit. What are you wasting time on? What tactics are you needlessly holding on to like a marketing security blanket? What can you eliminate from your budget? 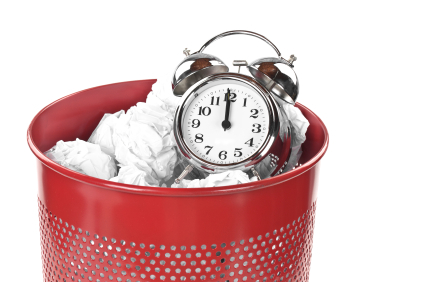 This blog post is going to outline five activities many marketers waste time but won't help you move the needle in 2013 -- so you can eliminate them for good! Do you remember around 2007 when a small handful of marketers started using social media as a marketing channel? Do you remember how almost everyone in the industry thought it was either 1) ridiculous, or 2) not applicable to their business or industry? fear of getting left behind. If the social networks you’re using aren’t working -- 2013 is the year to stop using them. For example, if you gave Pinterest the old college try, and it simply isn't driving any meaningful business results for you (like traffic, leads, customers), cut the cord. Just make sure you’re making your decision based on marketing analytics, not gut feelings. Much like the social media bandwagon we’ve all jumped on, most marketers are convinced they need to be blogging for their business. Of late, some marketers have taken this concept to the extreme, pumping out content at assembly-line pace. More blogging is better blogging, right? 92% of businesses that blog multiple times a day have acquired a customer from it (I'd bet those are high-quality blog posts, too, but I digress). But 78% of businesses that blog on just a daily basis have also acquired a customer from it. That differential isn’t too big. And if we bring down the volume just a tad to 2-3 times per week, still, 70% of business acquire a customer from their blog. If you're doing the fire hose blast of "meh" blog content, scale it back and spend the time creating high-quality content at a lower volume. To be great at SEO, you need inbound links. But to get inbound links, you need other sites to link to you. Hmm ... that doesn’t give you much control. refer to these as ‘microsites’ -- and link to my domain from those! Drop. This. Tactic. First of all, maintaining a bunch of websites takes a ridiculous amount of time and money. I mean, where are you getting all the content to keep them going? Plus, for your inbound links to mean anything, they need to be coming from a wide variety of high-quality sites that are relevant to your business. Unless you plan on creating hundreds of microsites that have a ton of clout in the SERPs, this strategy is a waste of your time. We’re the last ones to say you shouldn’t be reporting on your marketing; but with the 'big data' explosion has also come a whole lot of time wasted interpreting numbers and analytics that might not really mean anything for you right now. If you're worried that you're going to miss out on important data if you don't run all the reports in the world, don't. Use software that captures your data so that, when the time comes to get run more sophisticated reports, you have the historical data to do it. When you actually need it. The thinking behind the millions of press releases businesses produce each year is that they’ll get picked up and syndicated by an external site, and the syndication will come with an inbound link. Also, you know, getting press coverage. qualified readers and quality links.